Animals and rodents can be an expensive and unhealthy problem to your home or business. Humane traps or live traps capture the rodent or animal alive, so it can easily be removed, then released in an appropriate environment. 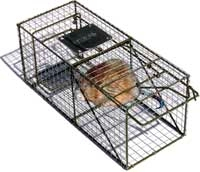 Traps are all constructed with galvanized wire and are designed to capture the animal harmlessly. This is particularly effective when there is a specific animal or rodent in question that is causing problems. Having it trapped alive, is proof that the proper animal or rodent was captured, and gives peace of mind that the job was done correctly the first time. See below for sizes available. Options: 101 - 24" 102 - 24" 201 - 36" 202 - 36" 301 - 48" 402 - 48" 404 - 60"
1/4" Steel Rod Frame 1" x 1"
3/8" Steel Rod Frame 1" x 1"